Bringing together reasons for why and where weeds occur and the ecological importance of weed management, this updated edition (previously entitled "Weed Ecology") provides an in-depth study of plant ecology with greater coverage of invasive plant biology and more concise statistics. 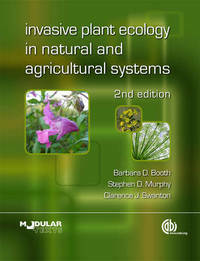 In a new, larger format, printed in two colours, and illustrated throughout with figures, tables and case studies it is an essential text for students in plant ecology, agriculture and horticulture. Barbara D. Booth is at the University of Guelph. Stephen D. Murphy is at the University of Guelph. Clarence J. Swanton is at the University of Guelph.